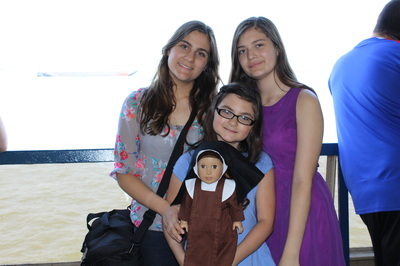 Therese's Little Missionaries was inspired by a trip to NYC in which we took our “Therese Doll”. While we rode the Staten Island Ferry, we started taking some pictures of the doll, shortly after an employee from the boat was awestruck by the doll and asked many questions about it as he was so interested in the doll. He asked, "Is that a Catholic nun doll and where he could get one." 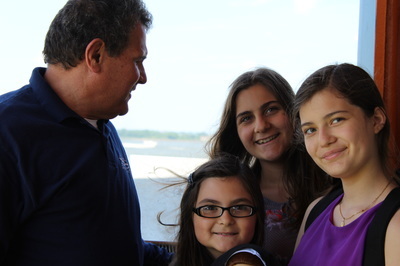 He liked the doll so much that he took us to the aft of the boat and took some pictures with us and of the doll for himself. He said that he was going to get one. Without us even realizing it, the doll served as a witness for Christ. This was an unexpected blessing of the doll as we had hoped to inspire children, but did not know how many adults will also be affected by this doll. 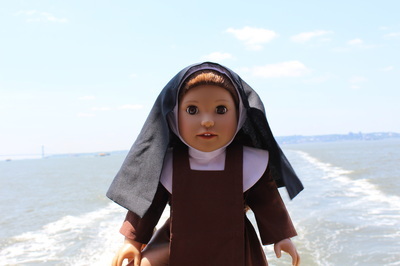 The witness of a Saint doll wearing a nun’s habit is a powerful witness of the love and sacrifice of nuns throughout the world. It was also one of St. Therese’s wishes to become a missionary for Christ, so we hope that in a small way through the Therese doll and book, children and adults can become a little missionary for Christ. “In spite of my littleness, I would like to enlighten souls as did the Prophets and the Doctors. I have the vocation of the Apostles. I would like to travel over the whole earth to preach your Name and to plant your glorious cross on infidel soil. But…one mission alone would not be sufficient for me, I would want to preach the Gospel on all the five continents simultaneously and even to the most remote isles. I would be a missionary, not for a few years only, but from the beginning of creation until the consummation of the ages” –St. Therese of Lisieux (The Story of a Soul). Since not everyone will be able to get a "Therese" doll you can still become a "Therese's Little Missionary" by getting the "I am Therese" book and giving it to anyone whom you think will benefit from a beautiful adaptation of the book that started St. Therese's missionary work, "The Story of a Soul". This book will help inspire everyone who reads it to become a saint. So there are two exciting ways to become a "Therese's Little Missionary". One way is to get the doll and taking it with you on various "Mission" trips or by giving a child the doll. Another way is by getting an "I am Therese" book and giving it to anyone you can think of to help inspire them to become a saint.